Two century-plus icons of Vancouver Island, The Fairmont Empress and The Butchart Gardens, have reunited for the second year in a row. 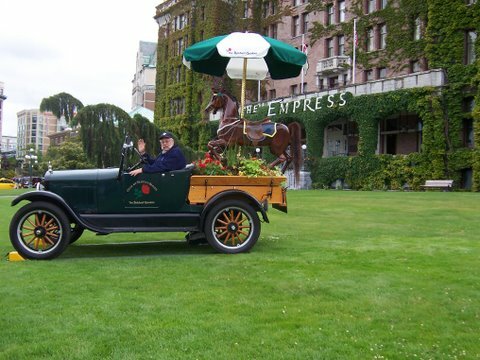 The Butchart Gardens' Model T Ford pick-up, festooned with flowers, is on the front lawn of The Fairmont Empress. This year, the Model T has an added feature, a mounted police horse from The Rose Carousel at The Gardens. The collaboration of the Victoria landmarks is to raise awareness to both locals and visitors about their afternoon teas and other highlights of their businesses. The Model T Ford pickup was designed and produced in 1908, the same year The Fairmont Empress opened. When The Butchart Gardens was developed in the 1920s, the Model T was the most common vehicle on the roads. Many of the trucks were used to transform the rock quarry into what has become a magnificent display garden. This particular truck delivered rural mail from 1926-1949 and is still a working part of The Gardens' fleet.